Kochi (colonial name Cochin) is a vibrant city situated on the south-west coast of the Indian peninsula in the breathtakingly scenic and prosperous state of Kerala. A city filled with glamour and endowed with tradition. Informally, Cochin is also referred to as the Gateway to Kerala. From time immemorial, the Arabs, British, Chinese, Dutch, and Portuguese have left indelible marks on the history and development of Cochin. Over the years, Cochin has emerged as the commercial and industrial capital of Kerala and is perhaps the second most important city on the west coast of India (after Mumbai/Bombay). Cochin is proud of its world class port and international airport that link it to many major cities worldwide. Places to visit in Kochi/Cochin Art complex Madhavan Nayar Foundation, Edappally – Located at Edappally, 10 kms north of Ernakulam en route to Alwaye, the complex consists of two units: the Gallery of Paintings and Sculptures which presents over 200 original paintings by contemporary Indian artists, some of them internationally acclaimed, and works of reputed Indian sculptors. The other unit, the Centre for Visual Arts is reserved for authentic reproductions of selected world masters from Leonardo da Vinci to those of the present century. The centre also exhibits certain larger-than-life mural reproductions of ancient Indian Art. Remains open between 10 AM to 5 PM. Remains closed on Monday & Public Holidays. The Protestant church was originally built by the Portuguese in 1510 AD and is believed to be the oldest church built by the Europeans in India. It is here the remains of the inveterate traveler, Vasco da Gamma were initially buried and 14 years later, his mortal remains were taken to Portugal. 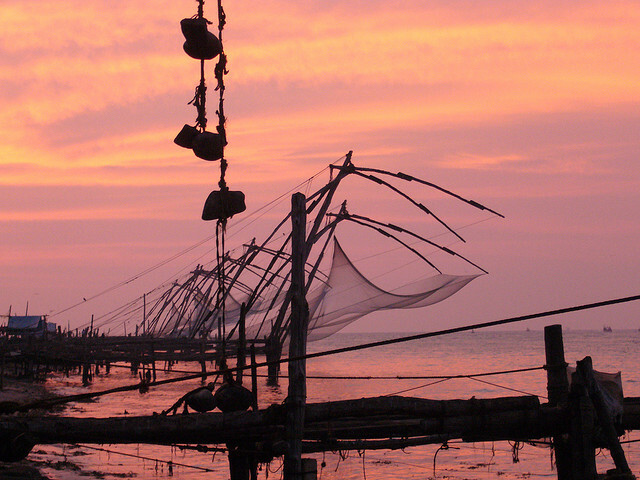 These fixed, cantilevered fishing nets, at the entrance of the Harbour, along the backwaters, were introduced by traders from the court of Kublai Khan. Records show that they were first erected between AD 1350 and 1450. The best place to watch these nets is from Vasco da Gama square, a narrow promenade that lies parallel to the beach. Consecrated in 1724, here’s an authentic reminder of the many men and women from Europe who came down all the way to play out their roles in the colonial 17th, 18th, and 19th centuries. The Palace at Mattancherry originally built by the Portuguese and presented to the Cochin raja Veera Kerala Varma in 1555, acquired its present name after 1663 when the Dutch carried out some extensive repairs. The Cochin rajas held their coronation ceremoniesin the Central Hall of this double-storey quadrangular building. Rooms adjacent contain breathtaking 17th-century murals depicting scenes from the Puranas and the great epics – the Ramayana and the Mahabharata.Open 10 AM to 5 PM. Remain closed on Friday for visitors. Located within the compound of the beautiful 1506 Bishop’s House, the museum established in a separate building showcases artifacts like statues and coins left back by the Portuguese.